In my last blog entry we explored Session Initiation Protocol (SIP) Trunking and why it might be used in a Voice over IP (VoIP) environment. SIP Trunking has become a hot topic lately and is offered in many different varieties. It is important to know that different providers offer their services in many different ways and while at times connecting to the trunk may be as simple as providing an IP address, there may be additional work required to get any fax server to interoperate with the SIP Trunk. Let me describe how SIP Trunking is currently being used by Open Text Fax Server customers. One of our customers brought in a SIP trunk from a provider that supported T.38 (T.38 is a Fax over IP standard created by the ITU and supported by Open Text Fax Server) and utilized a G.711 codec for call signaling. This configuration mirrors the requirements provided by the Open Text Fax Server to successfully transmit a fax via Fax over IP (FoIP). As a result the configuration was very straightforward. The service provider provided a demarc at the customers site and gave the customer an IP address to the session border element. All that was required for the customer to begin utilizing FoIP on the SIP Trunk was to configure the SR-140 card to point to the IP address of the session border element. An illustration of the implementation is below. When the customer sent a fax from the Fax Server it would go to the IP address of the Session Border Element and into the cloud. 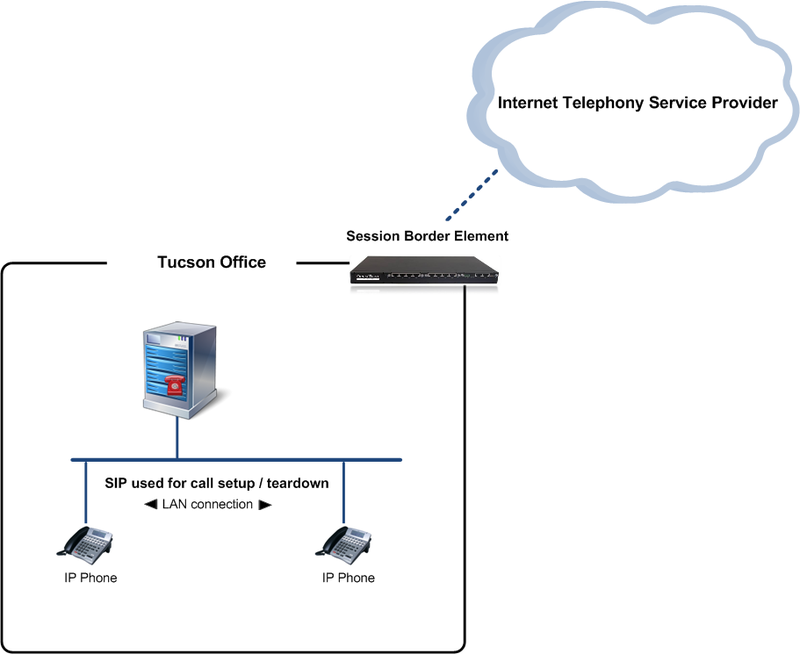 While the diagram shows an IP PBX system on the customer’s premises the Fax Server is not required to use the IP PBX to communicate with the SIP Trunk. The SIP Trunk allowed the customer to implement a VoIP and FoIP system with minimal capital outlay and maintenance requirements. There was no requirement to install, configure, and maintain gateway equipment nor was there a need to create complex dialing plans to route calls to specific locations for toll bypass. This is an example of a very simple SIP Trunk implementation. In my next blog entry we will look at a more complex scenario. You may have heard the term SIP Trunk being thrown around and wondered what all of the excitement is about. Well in order to understand what SIP Trunking is we should probably understand a little bit about how Voice over IP (VoIP) works. Session Initiation Protocol or SIP is a protocol which sets up and tears down a call that is carried over an IP network. Many organizations use SIP as a means to setup calls within their VoIP infrastructure. If I want to place a call to a colleague via our VoIP network, SIP will be used to setup the call and Real-time Transport Protocol (RTP) will be used to transmit my voice over our network. If I decide to place a call to my wife to let her know I will be late from work, SIP will still be used to setup the call but now we must have a way to interface with the telephone company to send the call to my home phone number. A gateway serves this purpose. The gateway will take the IP packets that my voice is translated into and convert it to analog information that can be sent over the PSTN. Likewise, my wife’s voice will be translated back into IP packets by the gateway so that they can be transmitted across the network. One of the reasons that an organization purchases a VoIP infrastructure is to save money on toll charges. Let’s use the example of making a call from my office in Tucson to a customer in Germany. 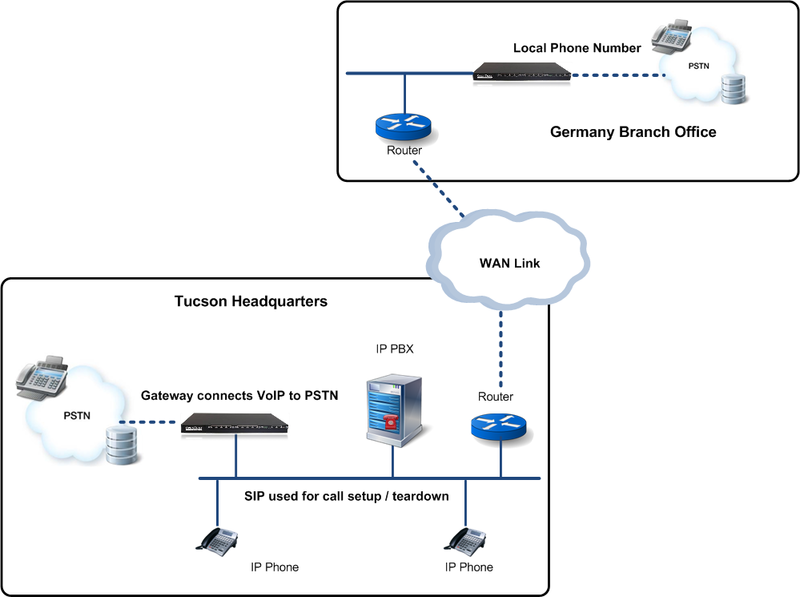 If I have an office in Germany that is linked via a Wide Area Network (WAN) to my office in Tucson I can add a gateway in Germany and route my calls across my network to that gateway. The gateway would place the call on the local PSTN in Germany bypassing toll charges. If our organization had offices all over the world with WAN links I could place a gateway in each office and bypass toll charges when calling customers or colleagues local to those areas. Smaller companies might not have the staff to maintain this sort of infrastructure. This is where SIP Trunks enter our story. SIP Trunks are offered by Internet Telephony Service Providers (ITSP) and allow an organization to see many of the benefits of a VoIP network without having to make a large capital outlay in the purchase of network infrastructure. The gateways that would be maintained in a standard VoIP implementation now move into the data cloud and are maintained by the ITSP. The organization purchases a SIP trunk from an ITSP and integrates it with an internal IP PBX. Connectivity is usually handled via a session border element that is maintained by the provider. Now when I make a call to my wife to let her know I am going to be late, the call is handed off from my IP PBX to the SIP trunk via the session border element and the provider routes the call to my home number via the PSTN. The organization only has to maintain the IP PBX. 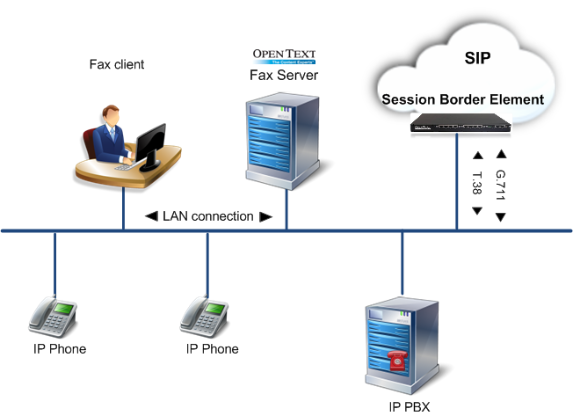 The OpenText Fax Server works with Global Crossing and Broadvox sip trunks. Cito Benelux® B.V. based in the Netherlands, is a subsidiary of Phoenix Contact and Rittal – global manufacturers headquartered in Germany. Cito Benelux distributes industrial electrical and electrical components as well as enclosure and housing technologies from the parent companies to offices across the Benelux region. Managing orders is the most important and urgent business process for Cito Benelux. The company receives more than 600 orders per day for electronic components and packaging; close to 70 percent, or 500, of those orders are sent to the company via fax. Faxes arrived on the machines and were printed on paper. Every five minutes an employee picked up the faxes and delivered them to those responsible for entering orders into the Baan ERP (Enterprise Resource Planning) system by hand. It took about an hour to take orders from fax arrival to entry into the ERP system. In the orders process, hours or minutes can mean the difference between on-time deliveries. Mistakes could mean a lost order or double order and double delivery of goods. Thanks to SecureComm in the Netherlands and an integrated system including Open Text’s Fax Server, RightFax Edition (with Microsoft Exchange module), Open Text Document Server, Alchemy Edition (with Web module) and Open Text Professional Services, Cito Benelux has been able to automate and optimize order processing – from hours to seconds. contact Matthijs Hols on +31 10 519 1466. Watch the Interop TMCnet Interview: Geoffrey Anderson, Sr. Product Manager of OpenText, speaks with Rich Tehrani, CEO of TMC. The product is specifically built for faxing making it easier to configure. The devices have been tested with an extensive number of switches. When product management first told me that we were going to have a media gateway in our line I was a little concerned. I had worked with other media gateways in the past and found them difficult to configure for faxing. One month later a cardboard box arrived at the office. It was the new gateway that had been pre-configured to work specifically for faxing. This is what my bosses were calling a single-purpose device. I opened the box, plugged the device in and gave it an IP address that allowed me to access it from my network. I opened the web based graphical interface, not sure of what I would find. After making a few changes to settings I was faxing. Next I wanted to explore some of the more advanced features. After some adjustments I was able to get the device to route to different Fax Servers based upon dialing rules I had created. I changed a few more settings and was able to set up the device to send to redundant Fax Servers. I would send a fax from a fax machine and if the first Fax Server was available the device would route to it. I shut down the first Fax Server and sent another fax to the gateway from a fax machine and the gateway automatically routed it to the second Fax Server. Finally I wanted to test if the gateway would automatically know if the first Fax Server was brought online. I turned the first Fax Server back on sent another fax and the gateway routed to it. Success! The Open Text Fax Gateways along with Open Text Fax Server provide everything needed to easily implement a Fax over IP solution. To learn more about the Open Text Fax Gateway, click here and be sure to download our new whitepaper on virtualization while you are there. Waterloo, ON. – March 02, 2010 – Open Text™ Corporation (NASDAQ: OTEX, TSX: OTC), the preeminent provider of Enterprise Content Management (ECM) software, today announced a complete range of fax gateways that give organizations of all sizes a single source for all their fax over IP (FoIP) needs. Easy to implement, the new Open Text Fax Gateway solutions are designed to help customers lower total cost of ownership (TCO) by consolidating voice and data network equipment for fax. FoIP implementations can have many variables, especially in larger and more complex networks. One of the more challenging aspects is figuring out how to properly configure, test and optimize a general-purpose media gateway to act as a fax gateway. By offering purpose-built fax gateways, optimized to work with the Open Text Fax Server, Open Text eliminates this complexity while giving customers and partners a single source for service and support. Open Text is the market leader in enterprise fax solutions offered with integration to the comprehensive management capabilities available in the Open Text ECM Suite. Communications networks in many organizations are often intermixed with circuit-switched (telephony) and packet-switched (IP) technologies. Open Text Fax Gateway serves as the bridge between these two divergent technologies and simplifies FoIP implementations by converting telephony communications — fax T.30 signals and TDM protocols— to standards-based SIP and T.38. Click to read the complete news release. Click to learn more about Fax Gateway for FoIP.